HiNative, the Q&A App for language learners has surpassed the 1 million registered users benchmark. The number of users on HiNative has been growing rapidly since entering 2017. 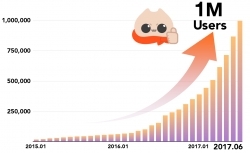 The total number of registered users increased from 390,000 in January to 500,000 in February before finally breaking 1 million on June 26. The increase was driven in large part by a surge in users outside of Lang-8, inc.’s domestic market, Japan. The app supports over 110 languages and has users accessing it from over 231 countries and regions around the world (stats via Google Analytics). HiNative is based on the idea of “Sharing the language knowledge and cultural experiences of people around the world.” Lang-8, Inc. plans to continue improving the platform until HiNative is recognized as the world’s premier language learning service. HiNative’s greatest feature is the community of users from all over the world asking and answering questions together. Lang-8, inc. wants to reach 2,500,000 registered users by the end of 2017 and 10,000,000 by the end of 2018. Ultimately, they aim to have 100,000,000 registered users on the platform. HiNative is a language learning app for smart devices and the web that allows users to teach each other their native languages. For example, if a Japanese speaker asks a question about English (US), a native speaker of American English will answer. In return, the poster can answer questions about Japanese. The service is not solely limited to Japanese and English, however. There are active communities of over 110 other languages, including Spanish and Korean, answering and asking questions right now.